I've had my eye on a set of heart shaped stamps for quite a while. They never made it to my shopping cart because I really don't use hearts all that much - not enough to justify the price. 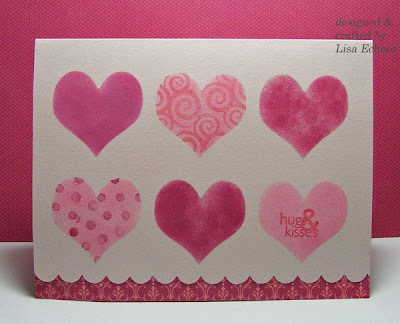 The stamps are heart shapes with pretty all over designs like polka dots and swirls. Well, I have those kind of designs already. So again I turned the the Cricut. 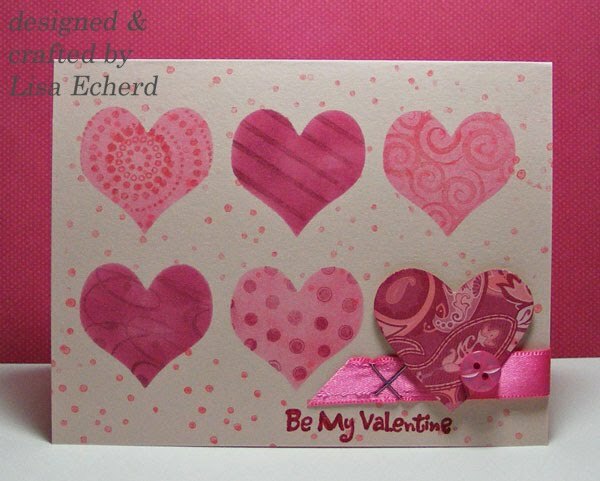 (Don't tune out on me if you don't have a Cricut, you can do the same thing with a punch :-) Using SCAL software I cut 6 hearts in two rows of 3 each that would fit on a regular card front. 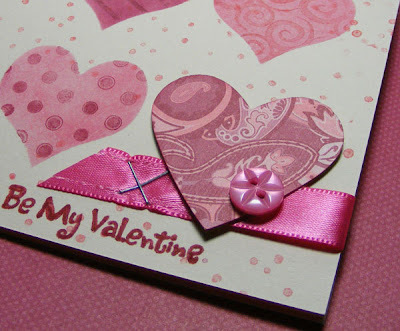 The hearts are a little smaller than my Stampin' Up! Full Heart punch. I placed this cutout mask onto a card front with some repositionable adhesive. Then I sponged on several ink colors in pinks and rose reds. 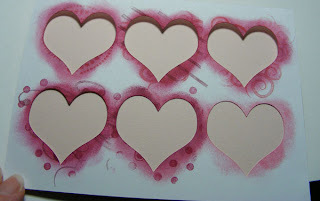 For some of the hearts, I did a tone-on-tone effect using swirls and polka dot stamps similar to the stamps I'd been eyeing. Playing with colors and patterns is such fun. I've been reading and seeing through on-line videos the benetifs of background and basic shape stamps for awhile now and I'm a believer. These types of stamps are so versatile. Note: If you don't have a Cricut or other paper shape cutter, you can do something very similar with a punch. To get your hearts all in a row, punch out grid paper. It is much easier to line up your punchs and spacing. The only catch I found was the Full Heart punch is too large to get 3 hearts on a standard size card width (5 1/2"), so you would need a different arrangement or a larger card front. DSP: Raspberry Tart from SU!